Certain amendments to the Social Security Code and the Acts on the Budget of the state social security system and the National Health Insurance Fund were promulgated in State Gazettes No. 94/30.11.2012, No. 99/14.12.2012 and No. 101/18.12.2012. The amendments shall come into force on 01.01.2013. Some of the most important changes in the social security taxation and legislation are summarized below. 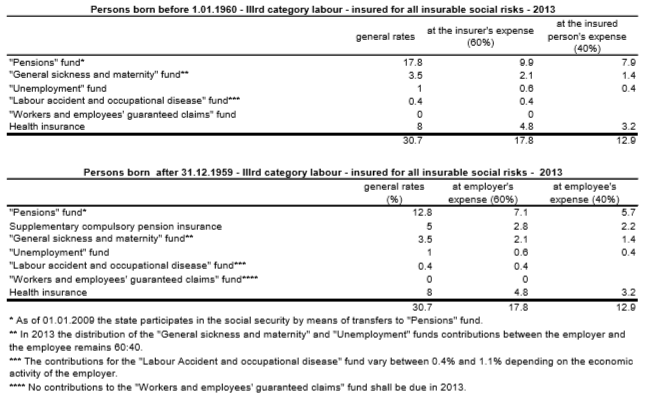 In 2013 the maximum income on which social security and heath insurance contributions shall be payable is increased from BGN 2000 to BGN 2200. The minimum social security thresholds for the persons employed under labour contracts and engaged in a number of business activities will also rise.